NASA installed the Enhanced Wideband Micro Tri-axial Accelerometer Unit (EWBMTAU) before launch so that it could monitor stresses on the module during inflation. It has subsequently been used for modal testing of the structure. This system was originally designed to monitor the wing leading edges of the Space Shuttle Orbiter to prevent another tragedy like the Columbia crash. Since inflation, the Distributed Impact Detection System (DIDS) has been monitoring for impacts from micrometeoroids and orbital debris (MMOD). DIDS was originally designed to monitor mars-bound spacecraft. It has been used for many ground and flight applications including leak location aboard the ISS. NASA has been monitoring temperature in the module using the Wireless Strain Gauge Instrumentation System (WSGIS), which comprises ultra low-power sensor units that have been modified to monitor temperature. WSGIS originally monitored strain on the Canadian arm of the Space Shuttle Orbiter. NASA wanted to ensure that it wasn’t overstressed after it was lengthened to facilitate inspection of the Orbiter after the Columbia tragedy. 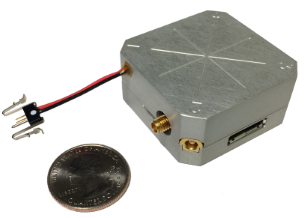 Finally, NASA uses the Internal Wireless Instrumentation System (IWIS) for modal testing by placing sensors in the BEAM along with its adjacent module. The highly-synchronized nature of IWIS has allowed NASA to perform modal analysis of the ISS since the beginning of its on-orbit assembly. Although these flight systems were originally flown for other applications, their flexibility has allowed them to be easily adapted to this new application.